I play bass with a ukelele band, we perform for fun at local charity events, private parties and small festivals etc. Before getting this combo I was using a 40 watt bass combo, which provided a good loud sound in conjunction with both my Kala Rumbler u bass and my Hofner violin bass. But I was looking for something smaller and more convenient to lug around than my current combo, especially for the weekly rehearsals when sometimes it was a long walk from the car to the room, where up to 30 or more members of the ukelele club meet. So any new combo had to as light as possible, as small as possible to fit in the tiny boot of my sports car, yet loud enough to compete with 30 noisy uke players scratching away and singing in a packed rehearsal room! 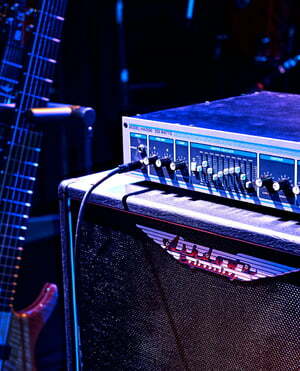 Researching every available make of bass amps online and in music shops proved to be a long process, and nothing I could find competed with the compactness combined with power of the combo I already had. But it was so darn heavy to carry and set up I kept looking. Eventually I came across the Markbass MicroMark 801, and although this was more costly than I originally wanted to pay, nothing else fitted my particular requirements. So I ordered one and hoped it would be as good as described. When it arrived in its little box I could hardly believe how small and compact it is. Basically cube shaped, it looks great with a black carpet type covering set off by an orange speaker cone. It sounded loud enough at home, but how would it cope at the clubroom? I was relieved to discover it EASILY had enough volume to play with my noisy fellow members with the amp set only at about half power, and that even at higher volumes there was no distortion or rattling of the cabinet. I have used it straight on a number of small gigs, and again there was no lack of volume when using it with a dozen or more people playing ukes acoustically, with even some of them plugged in and miked up for the singing. On larger gigs the Markbass has been plugged into the band's PA desk using the XLR output socket on the back of the combo, and it sounds really nice and big through this. The sound quality is excellent, very smooth, professional, and with no coloration, what you hear is the natural sound of your bass instrument. The combo is very quick to set up, plug in, turn on, adjust the volume and away you go. I really like the fact there is no messing around with bass, middle and treble knobs like on most other combos. You can't do that, there's just a volume control and one other filter knob that subtly shapes the sound. But it sounds naturally just great without all the usual fine tuning, you can concentrate on your playing and make any little adjustments to your tone with your instrument's controls if necessary. The amp is very quiet with no trace of any mains hum, and no noise or crackles when you turn the controls. If you want a monster sound and a monster rig to play at big gigs this is obviously not for you. However if you want a small, loud, great sounding little combo for rehearsals and use at smaller gigs this could be very suitable. It really suits the sound of the u bass, and I'm pleased I went for such a high quality product rather than a cheaper one! 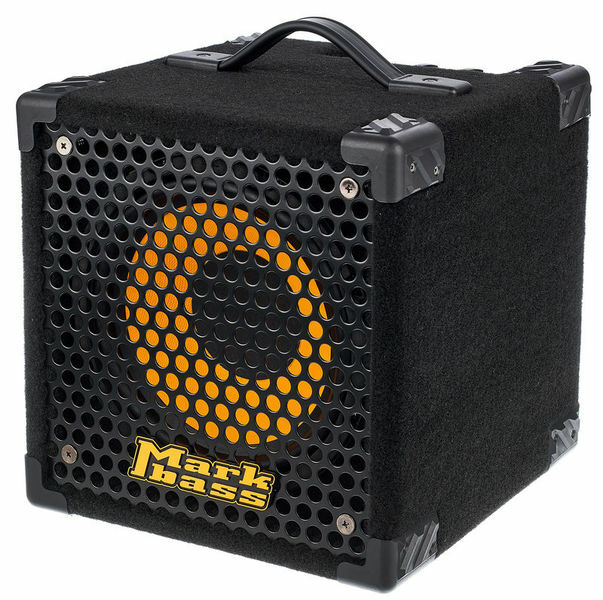 Markbass Micromark 801 has a great design and great tone come together with portability and simplicity. It?s very useful practise amp which doesn?t bother neighbours. The Micromark hasn?t got a boxy sound its sound is very good also very special which specially jazz bass players liked I think. I like the simplicity and Micromark has only volume and VPF (Variable Pre-shape Filter) knobs which I liked. It?s designed for practice but also it can be use for acoustic gigs. I had couple of reasons choosing Markbass Micromark 801. First of all its weight. It?s weight about 6-7 kg. Very good weight for 50 Watt Bass Amp and it?s size is very small you can put it every corner in your flat or house. If you want to get good sound from your bass but you don?t have a place and don?t want to disturb neighbours this amp is totally for your needs! By the way one of the main question about Micromark 801 is the sound of the fan. The fan is silent even at very low volumes ! I have just two disappointments about the amp: one is ?Designed in Italy Assembled in Indonesia? The Markbass is starting to produce some of their products in east asia but it?s still presents hight quality. The two is about it?s weight ?5,2 kg?. I think it?s more than 5,2 kg but it?s still lightweight. Weight was important for me because I don?t want to hurt my back when I carrying around the amp (my back is not very healthy) but like I said it?s still very heavy. Maybe Thomann can write the exact weight of the amp. I highly recommend this amp who wants to get good tone (not boxy) with small size and light weight. ID: 268671 © 1996–2019 Thomann GmbH Thomann loves you, because you rock!